It doesn't get any exciting than this. 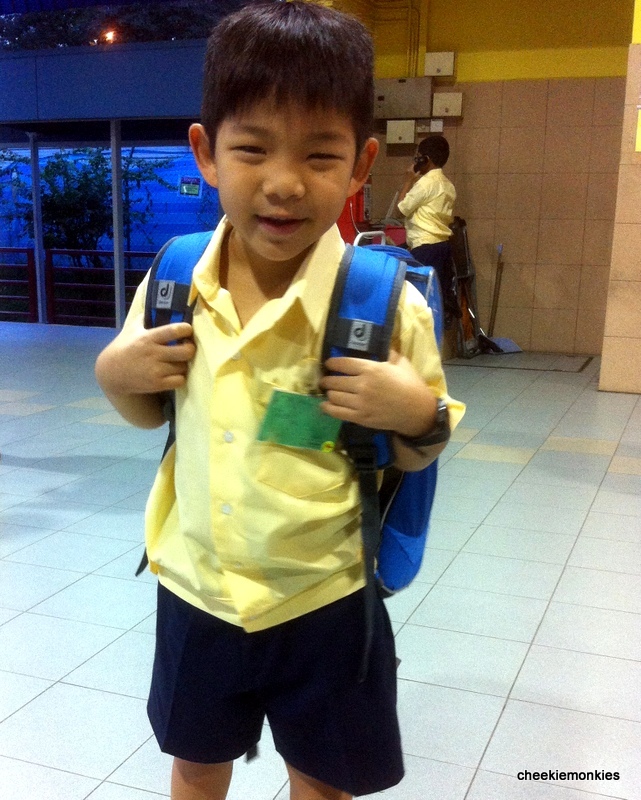 Ayd's first day of Primary School, Ash's progression to Primary 2 and... the whole routine of the wifey and me having to wake up at 5.30am once more. So yes, here we go again. I do suppose it is always tough to have to peel oneself away from the comforts of the bed especially after a festive break. But kudos to the 2 boys - and me - for making that extra effort to get ready for school in the wee hours of the morning, no matter how reluctant one may be. I love the photo above, for the simple reason it demonstrated the contrasting emotions that both Ash and Ayd were experiencing. One was gung-ho, excitement and nervousness all bundled into one, while the other exuded extreme reluctance to head back to school after 1.5 months of partying. That pretty much summed up the entire spectrum of emotions I was going through as well. Having gone through Ash's first day at Primary School last year, I reckoned it would be a piece of cake this time around. Or so I thought. Last year, as I released Ash's tiny hand away from mine when he trekked to his assembly area, I wondered about the most mundane of things - Would he be lost in school? Would he be able to buy his own food during recess time? Would he be able to walk steadily with his over-sized schoolbag? Would he be able to remember what his teacher said in class? But with Ash, I knew that he would somehow turn out fine at the back of my mind. With Ayd however, it was a different story all together. Because the 2 brothers are as different as chalk and cheese. Ash is the one who will tend to be more aware of what is going on around him, and will take it upon himself to solve problems on his own. Ayd, on the other hand, is more emotive and relies on his elder brother to help him out in certain areas and look out for him. One is definitely more dependent than the other. So with Ayd, the same questions that swished around in my mind during Ash's first day at school were very REAL indeed. After all, he did get lost in LEGOLAND Malaysia. Heh. But that's one aspect of Parenting isn't it? To learn how to let go. It seemed not too long ago that Ayd first embraced school life when he stumbled into Nursery 1 four years ago with his tears-stained face. Now, he has all grown up. As much as I am both reluctant and worried about letting Ayd's hand go, I knew he had to learn for himself at some point in time. 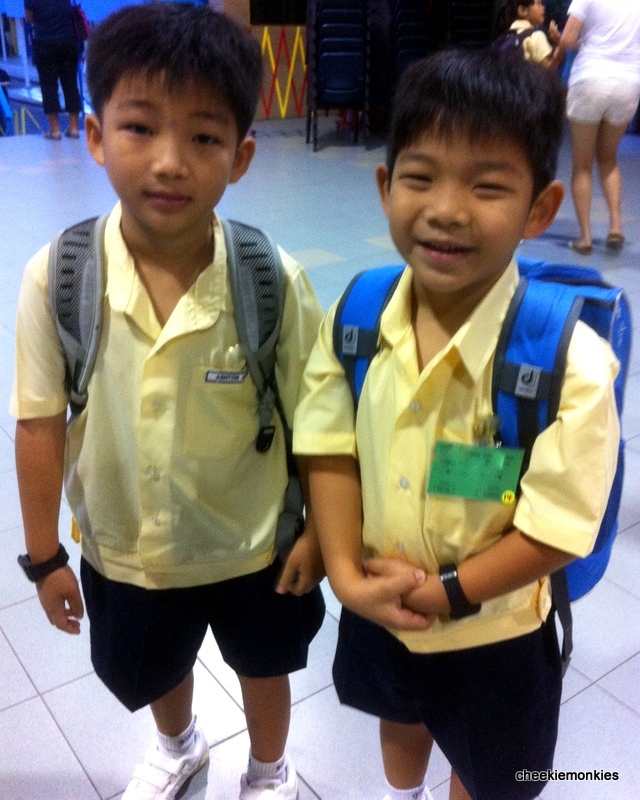 It was a good thing that the school has a buddy system in place where the Primary 4 children are assigned to be buddies of these group of Primary 1 fresh-lings for the first 2 weeks of school. So it was almost as uneventful as it can get when we bade Ayd farewell at his morning assembly area. 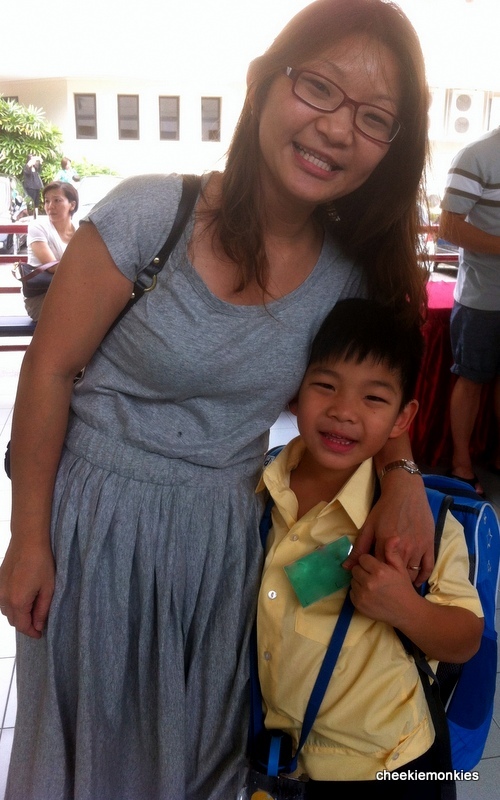 The wifey and I went for our breakfast and returned to the school just in time for Ayd's recess break. For the first three days of school, parents were allowed to meet briefly with their children at a designated waiting area during recess. We weren't allowed to enter the canteen though - the buddies would be there to watch over them as they buy their food and then shepherd them along to find the parents after that. Come dismissal time, that was where the action picked up. As he walked towards us, we noticed that he was preoccupied with his school bag straps. The straps kept sliding off his shoulders and he was trying his best to prevent it by turning his shoulder blades inwards. Quite a funny sight actually. 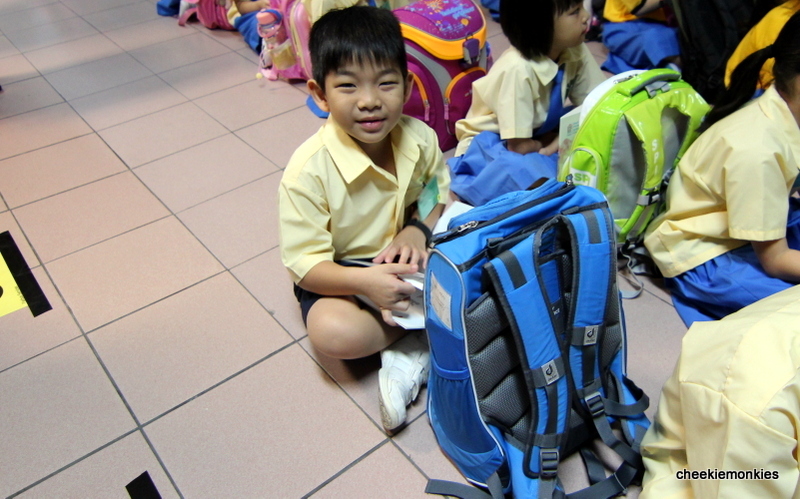 As he got nearer, we realised that he was carrying his school bag upside-down! And to think he was oblivious to it. But that wasn't the best part. 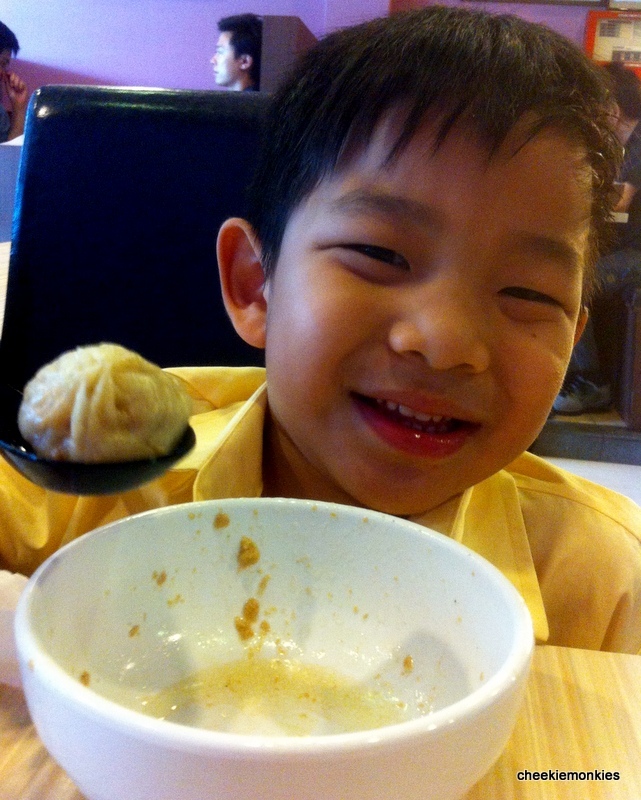 We found out later that he fell asleep during his Chinese period with the full blessing of his teacher! And the reason was because - as his teacher put it - he 'looked so tired'. This, despite the fact that he slept at 8.30pm the previous night! So the teacher asked him if he had wanted to sleep for a little while during class, and he of course took up the offer! I would too. After all, how often can one be given permission to sleep in class? Luckily though, it happened only once on the first day of school. Ayd managed to keep his eyes opened for the subsequent two school days and hopefully, it will stay that way for a long long time.... well, until university lectures that is. But overall, Ayd had not displayed any allergic reaction to primary school life so I would say everything has turned out pretty good so far. Good enough to warrant an XLB (or xiaolongbao) treat from the wifey and me! In other news, Ash has been appointed as Class Monitor for this school year and this is something that he was gunning for ever since last year. Don't ask me where he got this long-standing ambition of his from, I am just happy that he can finally put his bossiness and long-windedness to good use. But yes, I am immensely proud of him! So... GREAT JOB, both Ash & Ayd for a wonderful beginning to the New Year! And we are just getting started.